High Adventure is Your Companion Throughout the Land of Fate! There is no escaping Fate in the world of Zakhara, home of caliphs and favored land of the genies. And the Fate of brave adventurers is to travel the wide realms, vanquishing the unrighteous and protecting the meek. A Dozen and One Adventures leads the characters from bustling Muluk, City of Kings, to the mysterious citadel of flame, and many points between. They may meet the king who never died, the fish-people of the Great Sea, and other wonders too amazing to mention. 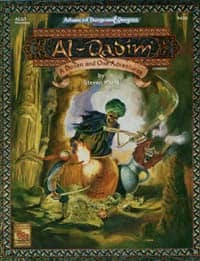 This adventure sourcebox contains a 64-page booklet of 13 adventures, a 32-page campaign guide describing Muluk, the northern lands, and several new magical items, a poster map of Muluk and Krak al-Niraan, six map cards, and four MC insert pages featuring NPCs.